The comment was the summary of what Glen de Vries, president and co-founder of Medidata Solutions, said about the firm’s advantageous technologies for clinical trials during a news conference in Seoul Tuesday. The health tech firm holds a conference every year inviting professionals from drugmakers, university hospitals, clinical trial centers, and clinical research organizations (CRO) to talk about innovative ideas for clinical trials. This year, the event “Medidata NEXT Seoul 2018” themed on “The NEXT Generation of Clinical Development” at Conrad Seoul in Yeouido. Medidata had 164 clients in Asia as of 2016, mostly Korean and Chinese. The company attributed its rapid growth in Asia to various solutions for clinical research. Medidata has established a system to trace the entire drug chain from the early stage of new drug development to post-market surveillance. The company provides various solutions such as RAVE and EDGE. 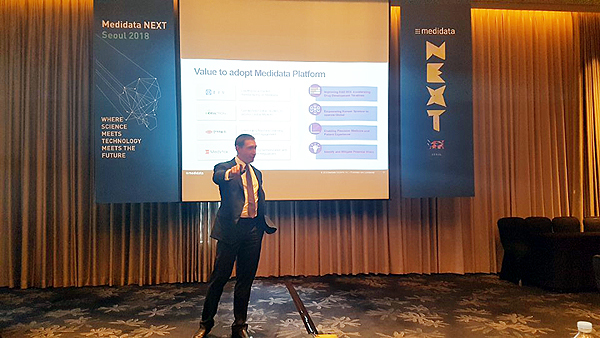 Glen de Vries, president and co-founder of Medidata Solutions, speaks on the next generation of clinical trial technologies in a conference, Medidata NEXT Seoul 2018, at Conrad Seoul in Yeouido, Tuesday. “Saving costs and optimizing operation are the two important keys for clinical trial solutions. Medidata will help you shorten the time for a new drug release by more than six months,” de Vries said. According to de Vries, two pharmaceutical rivals submitted data to the Food and Drug Administration to win approval for similar drugs at the same time, one obtained the nod and released its product in the second quarter but the other failed to do so. The major difference was whether the company used Medidata’s solution, he said. According to Medidata, the RAVE clinical trial solution directly helps a study progress, and EDGE raises data quality by diagnosing risks of clinical data and enables a trial to become strategic. The company also provides services for analyzing which drugs are suitable for which patients, through collecting and analyzing data errors and genetic information. Some drugmakers discovered a biomarker through such services, Medidata added. Medidata’s Chief Data Officer David Lee introduced ways to boost efficiency in clinical research through artificial intelligence and analytics. Later in the day, participants shared success stories of Medidata’s clients including drug companies, hospitals, and universities. They included Chong Kun Dang, Medytox, LSK Global Pharma Services, MediInsight, Asan Medical Center, and the University of Tokyo.